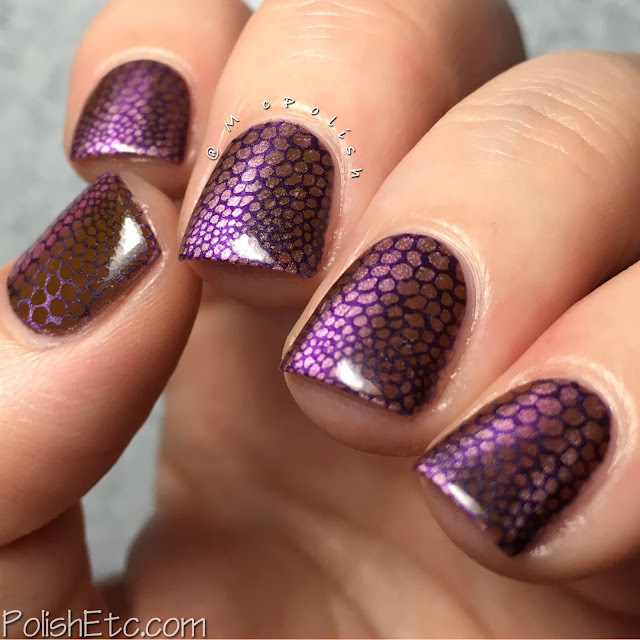 Animal Print for the #31DC2016Weekly - Polish Etc. Holy moly...I am so excited to share my #31DC2016Weekly mani with you all. I played around with some Masura magnetic polishes again and I am in awe at just how freaking cool my manicure turned out. I am going to apologize in advance for the large amount of photos of this one mani but you need to see it. I was inspired by a nail artist I found on Instagram through some shares on the Masura page. The user @deryabinayulia (this is just an example of her work, you must look through ther account!) 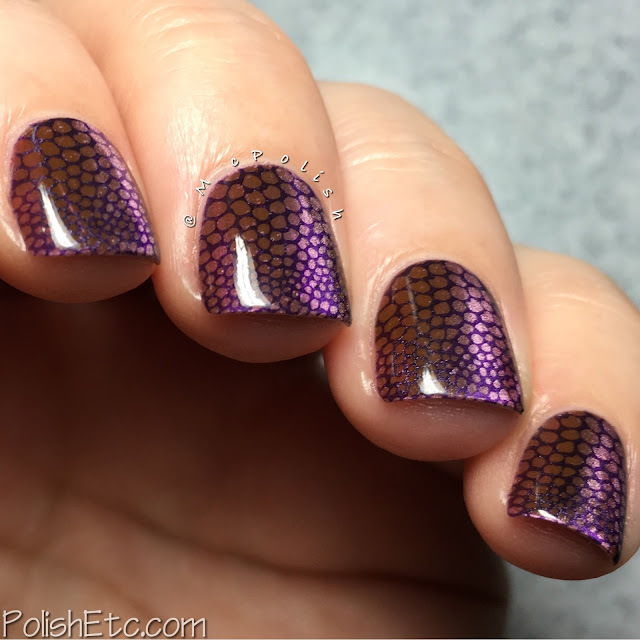 does these crazy, amazing looking snake/alligator/reptile skin manicures with gel polishes (I am pretty sure they are gel, I don't read Russian). I am mesmerized by them. So I tried to do my own version using magnetic polish and stamping. I am am tickled pink with my results! Lots of pics to come! I started out with a base of Masura "Tourmaline of Passion" (#904-172) which is one of their magnetic gemstone polishes. It has a brownish tan base with a pink metallic magnetic finish. When applying this color I was totally unimpressed. 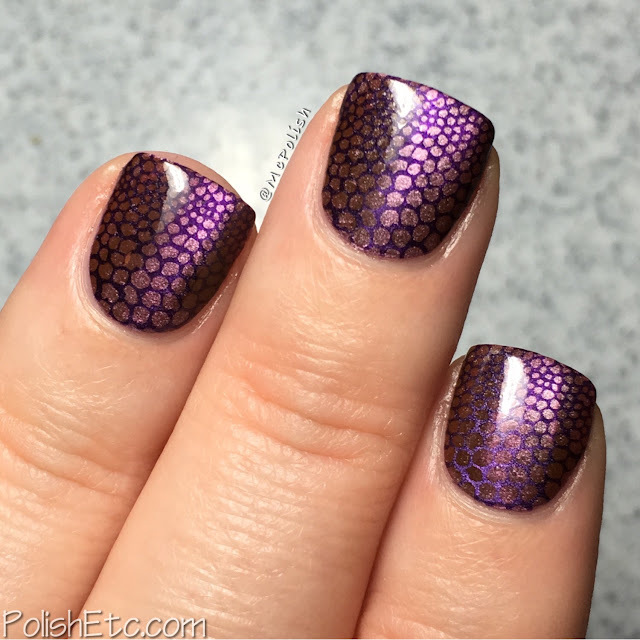 But once I applied the magnet and the stamping it became gorgeous. I applied a glossy top coat and used the super strong neodymium magnet in a straight line down the middle of my finger. 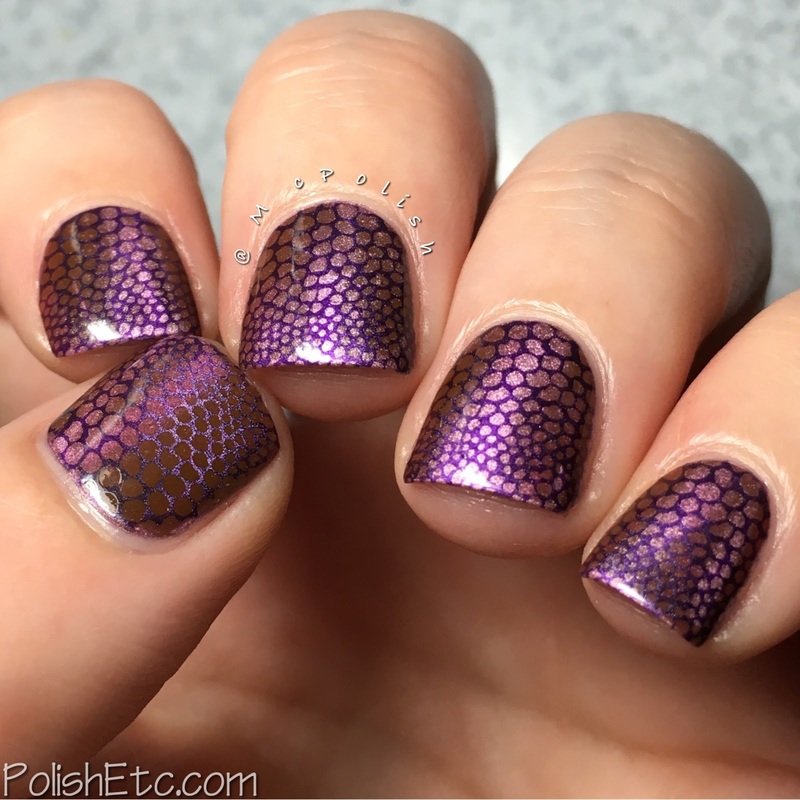 Then I used deep purple, Masura "Lilac Angelite" (#904-169), to stamp on a reptilian design from the Winstonia W101 plate. I again applied a glossy top coat and repeated the magnet application. I had to include a video. It is the only way to truly appreciate the magical quality of these magnetic polishes. You can also view it from my Instagram account that might be a little better quality. I am in love. Are you in love? 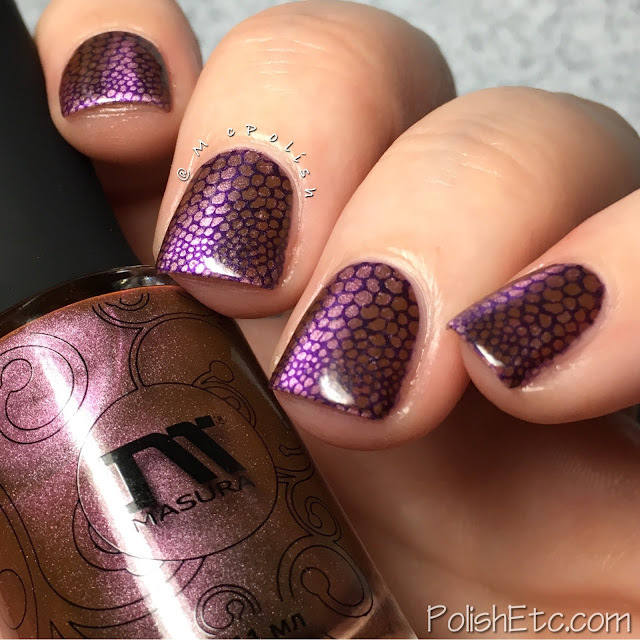 Right now, it looks like you can get your own Masura magnetic polishes from their website and also from Hypnotic Polish. Shipping will take several weeks depending on where you are in the world but they are well worth it. 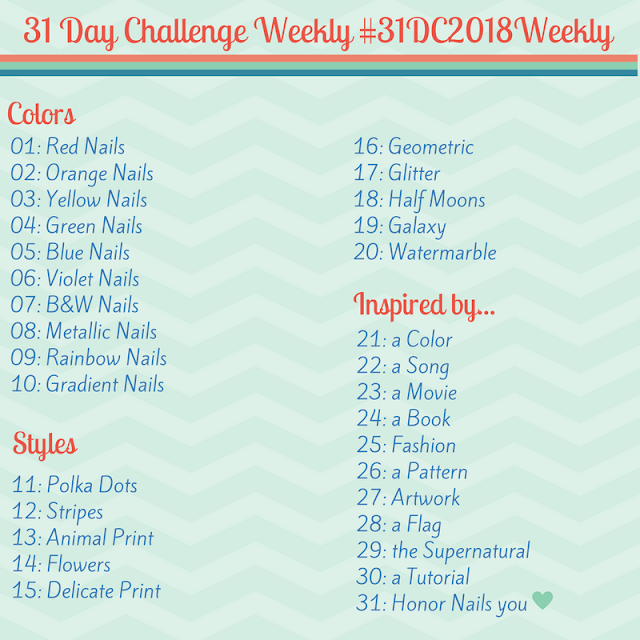 Be sure to check out the tag #31DC2016Weekly on Instagram, Twitter and Facebook to see all of the other Animal Print inspired nail art for the challenge. If you want to join in with me, you have plenty of time! You can either catch up and do all of the prompts or you can just dive and and start here. I will be doing this challenge weekly until October 1st. Learn more about the #31DC2016Weekly here. Drop dead gorgeous! I just can't get enough of this! That is an absolutely stunning design and effect! :) I love love love it!